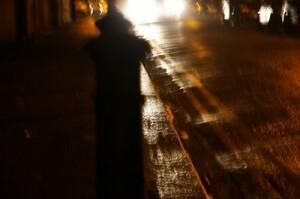 During the last month I noticed a plethora of ‘bollards’ having been planted along the roadside. Being ugly lumps of metal the Council have decided to disguise them by painting them black. I believe that this one is to prevent drivers parking on the kerb. Since about 25% of all driving fatalities are caused by collisions with street furniture, such as these ‘bollards’, I am at a loss as to why they have been allowed to proliferate, let alone be painted in camouflage colours. 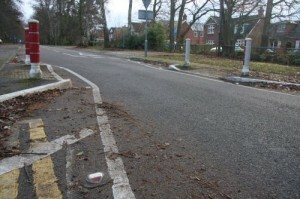 These ‘bollards’ found on the Broadmoor estate are far safer. They are covered in two colour retro-reflective film and have LED marker lights to make them even more visible. Naturally these safer ‘bollards’ will cost more but if cost cutting is an issue, why are ‘bollards’ put up everywhere? No doubt when accident statistics reveal the folly of these ugly black lumps being set in the roadside then they will be removed.